Turkey is preparing for a new operation in Syria. Against the Kurdish Popular Self-Defense Detachments (YPG). This is evidenced by several factors. The Turkish Armed Forces launched rocket attacks on several villages west of Kobani, one of the capitals of Syrian Kurdistan. At Incirlik airbase, there is a large activity of military equipment. And most importantly, a statement was made by Turkish President Recep Tayyip Erdogan. 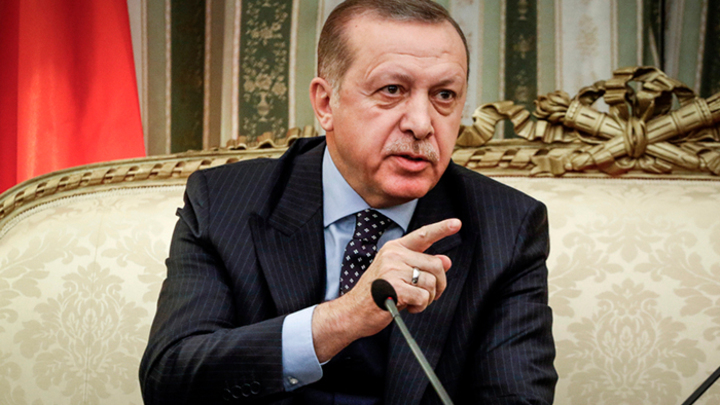 - Erdogan said before the deputies of the Justice and Development Party, adding that Ankara will soon overwhelm the YPG with all its might. The ousting of Kurdish forces from northeastern Syria is a strategic goal of the Turkish intervention. In early 2018, the Turks had already cleared one of the three Kurdish cantons - Afrin (“Olive branch”) from YPG, and before that they had occupied the Azaz-Jerablus-El-Bab triangle, displacing ISIS (“Euphrates Shield”) from there. Now the queue is much more complicated operation. Here behind the Euphrates, the main forces of the Kurds are concentrated, about 60-70 thousand fighters. In their territories are located more than a dozen American military bases. Since the US Coalition’s operation against ISIS for the Pentagon, the YPG has been the main ally on earth, which the US has supplied with money and weapons. Putting at stake relations with Turkey, which considers the YPG to be a continuation of the Kurdistan Workers' Party, that is, terrorists. Understanding the fears of their NATO ally, the US is still not in a hurry to leave Kurds at the mercy of Erdogan. The defeat of the YPG is equivalent to the departure of the States from the most oil-bearing regions of Syria. The Americans are trying to outwit the Turks and in the summer even offered to jointly patrol the city of Manbij, which Erdogan declared the next target after the capture of Afrin. The Pentagon promised to withdraw Kurdish militants from the city of Manbij and allegedly handed over control to the local military council. But the Turkish Foreign Ministry doubts that YPG has left the city. In Afrin, Washington did not or hardly objected. This time the Turks may have difficulties. In Manbij, as well as in the provinces of Rakka, Hasak and Deir ez-Zor, the American international coalition has already managed to create a noticeable military infrastructure, in the Kurdish territories there are strong points of the United States and France. Considering these factors, no repetitions are foreseen. Another thing is that the Turks will systematically squeeze the Kurds using a wide toolkit. It is not always necessary to do the dirty work with the hands of their soldiers. The Turks have enough opportunities to create problems for YPG. Once again, the US will have to make hard choices: lose face, balance between old NATO member-Turkey and those whom they trained and armed - Kirds . But the operation is inevitable. This operation against the project of the United States, Israel and the PKK. This territory is a springboard against Turkey, against its territorial integrity. Therefore, for the Turks, this is not only a question of terror, but a seizure by the West of the Middle East. It should be emphasized that in such an operation, Ankara needs coordination with Damascus, which also opposes Kurdish separatism. This common interest will probably force them to work together. Despite the common interest, Ankara still considers Bashar al-Assad illegitimate and supports the armed opposition. From the point of view of Damascus, there is not much difference in who controls the east of the Euphrates - the Turks or Kurds under the leadership of the United States. Assad considers all of them occupiers. However, in a sense, ousting Kurdish militants and their cartridges from Washington to Damascus is beneficial. The crossing of the Euphrates will be the beginning of a large and protracted Turkish operation in Syria. Ankara runs the risk of entering into the largest crisis in relations with the United States, which will hardly just leave the Arab country. The NATO split in Syria will strengthen the cards of Russia and weaken Washington’s position in the region. But we must understand that the exclusion of the United States will not solve the problem of the unity of Syria.